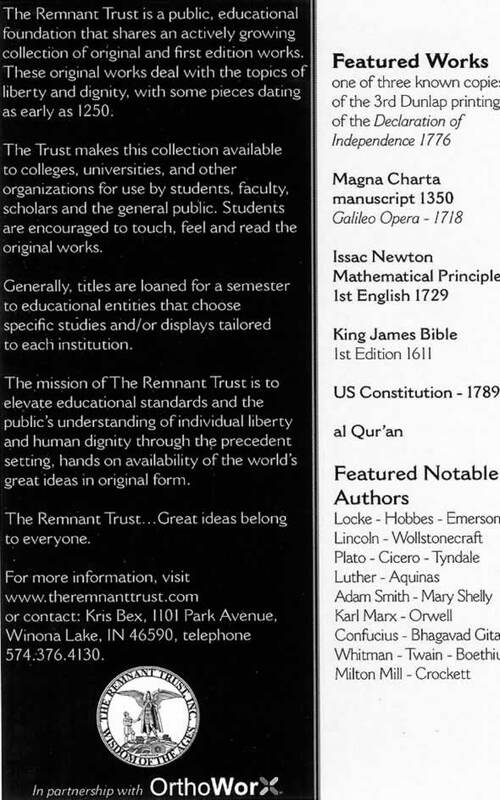 As mentioned here previously, I had the opportunity to attend an event put on by The Remnant Trust last week. An Open House was held at their facility in Winona Lake, followed by a meal and program at a local banquet facility. As with everything associated with The Remnant Trust, it was handled professionally and was very entertaining. I was afforded the opportunity to meet with members of The Remnant Trust board as well as prominent citizens of Warsaw and the surrounding area. It was rewarding to be able to discuss our work on the facility with the people that made it possible. The Open House included access to the vault where they had character actors portraying two of our Founding Fathers, James Madison and Thomas Jefferson. It is always interesting to see these portrayals and fascinating to see how they choose to handle interactions with the modern world. In this case, they chose to handle it as having made the trip from the east coast and being somewhat surprised that the native population was a bit more advanced than their scouts and explorers had led them to believe… They each went through the vault and discussed books that they were familiar with from their time or earlier, discussing how these books had affected their lives and philosophies. Listening to “Thomas Jefferson” discuss the works of Aristotle and “James Madison” discuss the Magna Charta was fascinating. At the banquet center, the former Presidents continued to circulate through the crowd discussing various issues. A period accurate meal was served with several dishes prepared in the custom of that time including things like lamb with mint jelly, venison and black-eyed peas. Everything was quite good! After the meal, two videos were shown illustrating the public work that The Remnant Trust pursues. Interviews with grade school children in Fort Wayne that had been given the opportunity to touch and work with the documents was particularly interesting. From the video I learned that using the character actors to present their documents to the public is one of their standard practices. I can attest that it was effective! The Presidents were asked to make comments on what they had seen there, which they did in historical context. Then questions and answers came from the audience. A couple of questions were obviously asked to test the knowledge of the actors and they rose to the occasion with admirable knowledge. I was quite impressed as several of the questions showed historical knowledge that was beyond me and the actors barely paused before giving eloquent responses. All in all, it was an enjoyable evening. Educational and Fun! It was quite fitting just days before celebrating Independence Day. Thank you Kris and Miranda for including me!